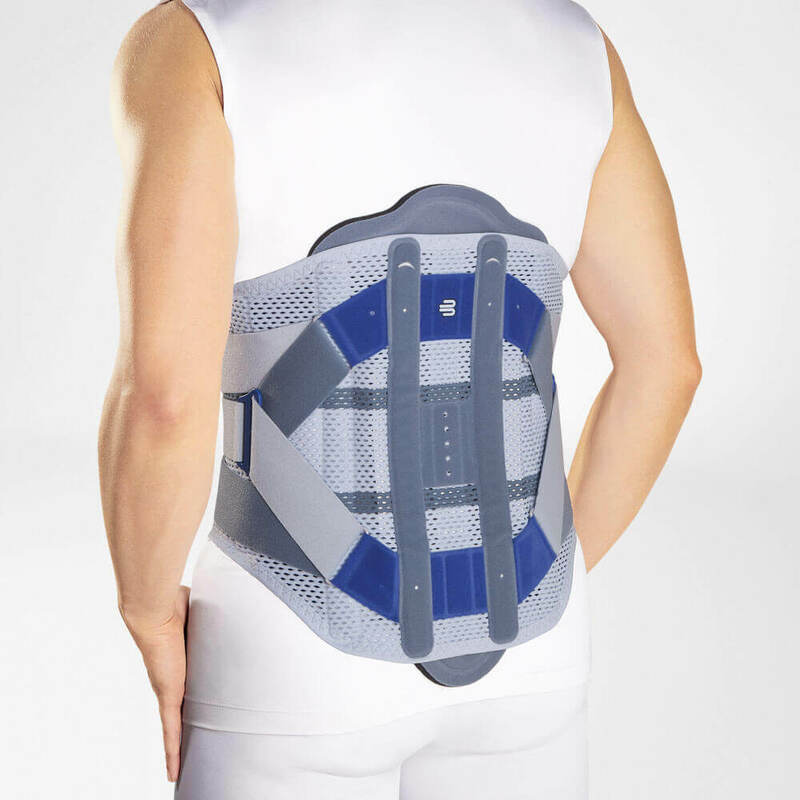 The anatomically contoured back pad provides post-operative or initial conservative support. The anatomically contoured back pad provides post-operative or initial conservative support for the lumbar spine. Its light and flat construction and soft cushioning make the orthosis comfortable to wear. Incorporated corset stays provide additional stability for the spine and help to straighten it. The breathable Spinova mesh material adapts perfectly to the patient's body shape and ensures excellent wearing comfort. The anatomically shaped abdominal fastening with comfortable edges and large finger pockets makes it easier to put on and take off the orthosis. An abdominal pad can also be attached with Velcro to increase compression on the abdominal cavity and provide additional relief for the spine. Indications: Vertebral displacement, formation of gaps in the vertebral joints (spondylolysis/spondylolisthesis, grade II), Wearing of the vertebral joints (facet syndrome) _Radiating pain in the lumbar spine area (moderate [pseudo] radicular lumbar syndrome/lumbar sciatica, moderate), Narrowing of the spinal canal (lumbar spinal canal stenosis [conservative, post-operative]), Vertebral fractures of the lumbar spine, Weak muscles with limited performance (degeneration/muscular insufficiency of the spine), Following an intervertebral disk prolapse (conservative/post-operative), Intervertebral disk surgery (discectomy), Post-operative, one or more levels of the spine (e.g. spondylodesis), Osteoporosis. Size: 1 (70-80cm), 2 (80-90cm), 3 (90-105cm), 4 (105-115cm), 5 (115-125cm), 6 (125-140cm). Waist circumference in cm.